Lockjaw, Annihilus, and D-Man (turned into a half-dragon-man) fighting mid-air. You know, same old same old. Outside of that one incredible moment in the ‘90s in which their universes were literally smushed together, DC and Marvel usually keep their houses in order and well away from each other. But recently, Marvel has been making some sneaky little trips into the reality of its fellow comics publisher. A couple of months ago, Infinity Countdown Prime gave us a cheeky cameo of none other than DC hero Shazam—identified in context by his original moniker of Captain Marvel—as the wielder of his reality’s version of the Reality Stone. But now two of DC’s heaviest hitters have made a similar appearance in the pages of this week’s Lockjaw #4. Lockjaw—by Daniel Kibblesmith, Carlos Villa, Roberto Poggi, Chris O’Halloran, and Clayton Cowles—has seen the titular pup on a quest to find his fellow giant doggy-siblings with Z-List Marvel hero D-Man at his side. This week’s issue was the climax of Lockjaw’s quest, as he uncovered the origins of how his siblings went missing in the first place, and strove to hunt down the final member of his family... who, it turns out, had been captured by none other than longtime Fantastic Four foe Annihilus. Annihilus seems like a bad pet owner. Annihilus intends to use the the poor pooch’s genetic ability to teleport, offering a way for him to send whole worlds into the path of his annihilation waves, and naturally Lockjaw wants none of that. 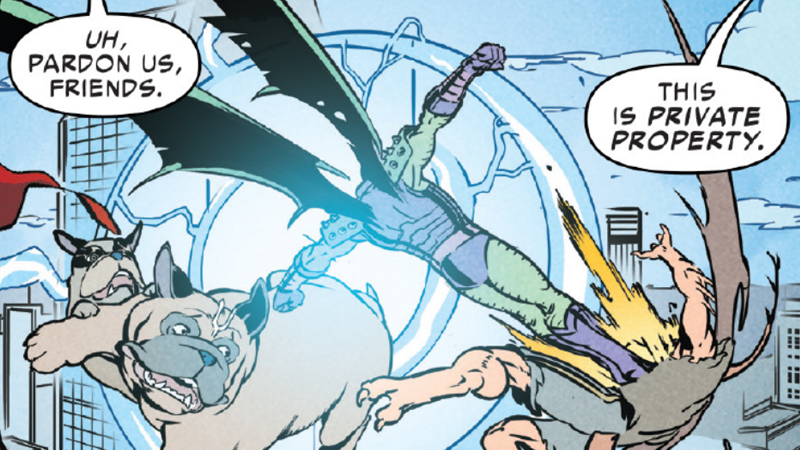 So our canine hero leaps into action (alongside a D-Man who gets transformed into a Dragon-Man by his inhaler, as one does) to combat Annihilus in a teleporting battle across the whole multiverse. Their scrap takes them everywhere from the Negative Zone to the World Between Worlds (the current location of the soon-returning Fantastic Four), from the recently-reborn Ultimate Marvel Universe to Duckworld, Howard the Duck’s original reality. But then it takes them to the most dangerous part of the multiverse imaginable: the dreaded “[REDACTED]”. Honestly, which is weirder: Superman and Wonder Woman in a Marvel comic or a fidget spinner reference in this, the year of our Lord 2018? That realm looks, of course, very familiar, and features some uncannily dressed heroes who are not too pleased at Lockjaw and Annihilus’ intrusion. It’s all very cute—but we started with a mere arm of Shazam, and now we’ve got the lower halves of Wonder Woman and Superman in the pages of Marvel Comics. How much longer until someone from DC makes a full-on appearance somewhere? Watchmen or DC Comics: Which Reality Has Had It Worse?